the nature of the remaining features as sadly none of the stones are now standing. From Owler Bar take the signposted road for Hathersage, the B6054, park at the first small lay-by on your left, opposite the pump house. Take the gate by the side of the pump house and just follow the obvious path for around 800 metres till you see the large modern cairn off to your right, you can't miss it, take the path that leads up to it and once there walk 40 - 50 metres downhill heading North, the remains of the unusually wide bank should just be visible in the short grass along with a collection of stones, the largest around 1 metre long. Despite what you read elsewhere it's totally safe to walk on this part of the moor, the shooting range marked "danger area" is located below Brown Edge well away from the circle. 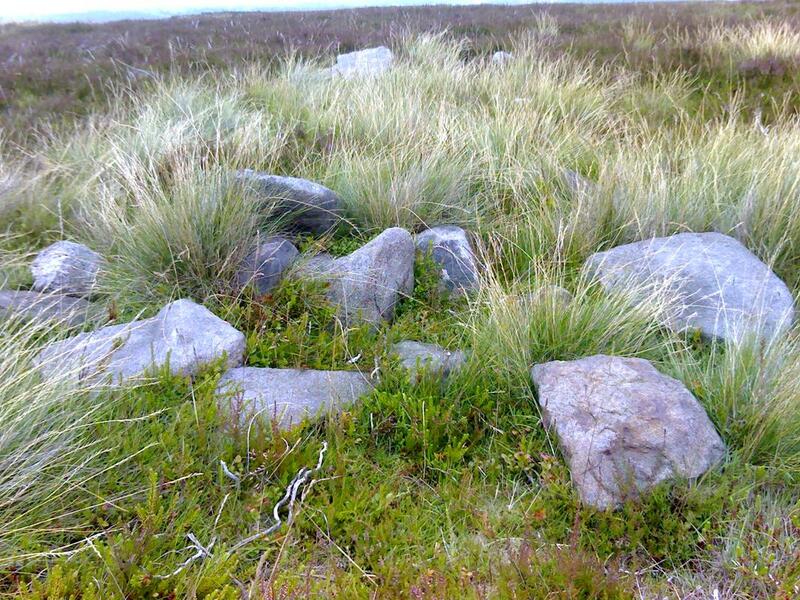 View towards the cairn from the circle.